Dry skin can happen to everyone, but it starts to become a serious problem when the seasons change. It's now Spring in Australia and while our legs have been hidden for months, with the weather heating up the last thing we want to show off is scaly legs and arms. I've bought so many of these Nivea In-Shower body lotions since they were released. I always stock up on these when I see them on sale at Priceline or Coles. This version is my favourite as I find that it's not too heavy, but still offers enough moisture even if I use this and skip a moisturiser. It's also fantastic for anyone that has extremely dry skin as you can use this in the shower and then follow up with your usual moisturiser. 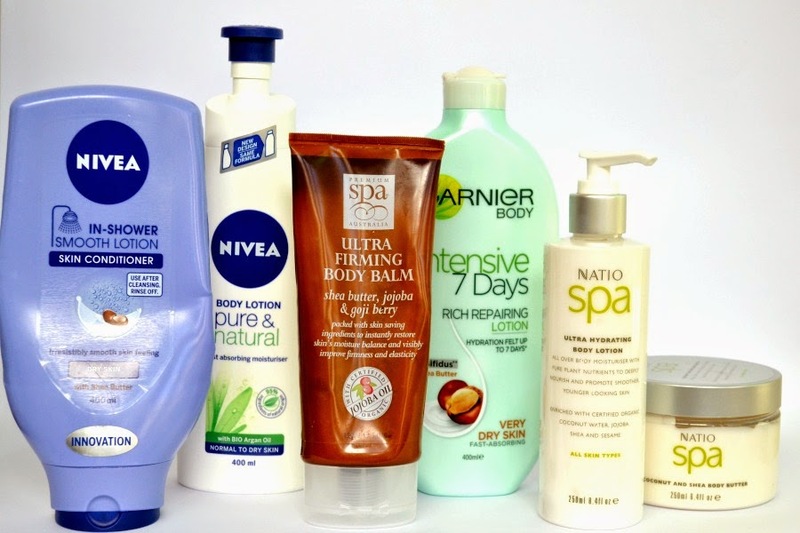 It's for normal to dry skin, so it's great for layering (like with the Nivea In Shower Lotion) without leaving you sticky or it feeling heavy on your skin. I love the new larger bottles that have a pump. It makes life easier than having to fiddle with a lid when your hands are greasy from a moisturiser! This is probably my favourite moisturiser out of the Nivea range as it's light and has a gorgeous subtle plant based scent. This contains certified organic jojoba oil, as well as shea butter and goji berry. The scent is slightly herbally, but in a subtle way. I also adore the Premium Spa Frangipani & Coconut SOS Moisture Balm for a sweeter scent. It's perfect for spring!! I think the claims of "hydration felt up to 7 days" is nonsense, but it's really moisturising and absorbs fast into your skin. It has a subtle smell that's more on the plant based side. I've been really impressed with this and it's the second bottle that I've bought. This moisturiser isn't thick and glugy like other body butters. It has a really smooth consistency. There is also a Natio Spa Ultra Hydrating Body Lotion for those that prefer something a bit lighter. It has a pump, so it's great for those that don't like dealing with lids on tubs! Both the body lotion and the body butter contain certified organic coconut, shea butter and jojoba oil. Both of these are under $20, so it's an affordable option that feels luxurious. Another 2 products that I wanted to mention (but have used up and don't have images of) is the Dirty Works Coconut Body Butter. It has a light coconut fragrance. It feels heavier and thicker than the Natio Spa body butter, but still moisturises into the skin quickly and easily. The Boots Optiva Comforting Body Balm is another great body lotion. It sinks into the skin easily and quickly and is perfect all year round. It has great packaging and Amcal pharmacies often has this on sale! 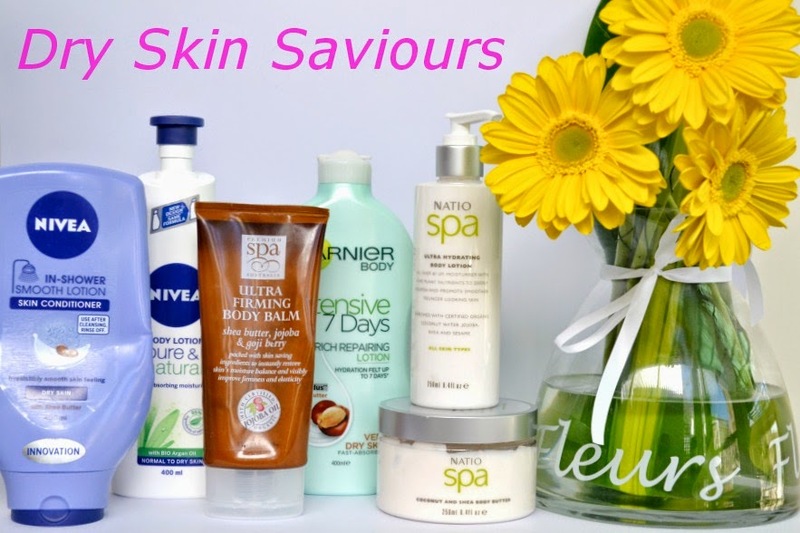 What's your favourite body product to use when your skin is looking a bit scaly?